The Untours Foundation Board of Directors oversees all aspects of the Foundation’s work and ensures the fulfillment of the Untours Foundation’s mission. 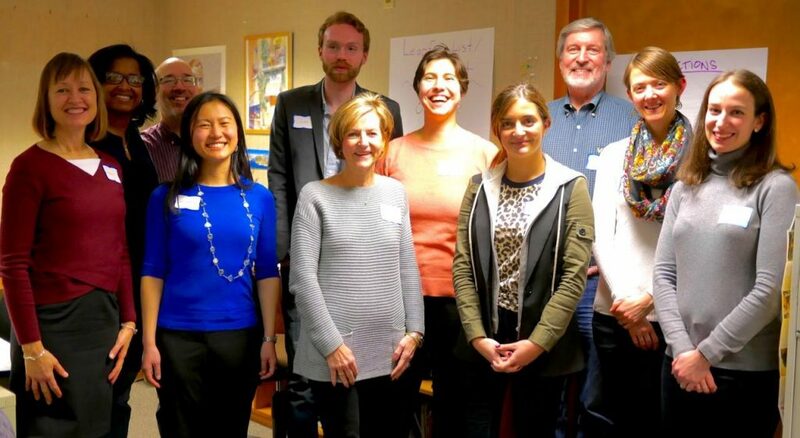 From L-R: Elizabeth Killough, Lisa Hunter-Mitchell, Brian Taussig-Lux, Linshuang Lu, Caleb Harvey, Pat Beauchamp, Heather Van Dusen, Olivia McConnell, John McCall, Sarah Cooper Searight, Lauren DeLuca. Heather Van Dusen is a consultant for B Corporations. She was the first employee at B Lab, the nonprofit that certifies and supports B Corporations and that facilitates the passage of benefit corporation legislation. Heather has held positions at B Lab in the standards, policy, and business development arenas. Born and raised in the Philadelphia suburbs, she has worked with local environmental and community advocacy groups there such as PennEnvironment and CeaseFirePa. Ms. Van Dusen graduated Phi Beta Kappa with a degree in religion from Amherst College. Patricia Beauchamp holds a degree in Business Administration from the University of Connecticut, with a major in Marketing, and received a certificate from the Fuqua School of Business executive management program. For more than 35 years, Pat has held leadership positions in marketing and corporate communications within the financial services industry for mid-size as well as national and international companies. Pat, who recently retired, has been involved with the Untours Foundation as a volunteer and is now looking forward to having an even greater impact on its work. Lisa Hunter-Mitchell is part of the executive management staff for the Burlington Coat Factory and has extensive knowledge in the areas of both marketing and strategy development. She is also active in the community as a Board member of Home of the Sparrow , an NGO that helps single women and single women with children or pregnant, receive housing, job training and support/ holistic services that address the core issues of homelessness. Lauren DeLuca holds a BA from Swarthmore College and a law degree from Villanova University. After completing law school, Lauren served as a law clerk for The Honorable Paul R. Wallace of the Superior Court of Delaware. During law school, Lauren was an Articles Editor for the Villanova Law Review and Co-President of the Women’s Law Caucus (2012-2013). She also served as a Certified Legal Intern at the Villanova Farmworker Legal Aid Clinic, where she represented the plaintiff in a workers’ compensation retaliation claim. Lauren is actively involved in pro bono work and serves as a volunteer attorney at the Face to Face Legal Center in Germantown, Pennsylvania. Board member Heather Van Dusen (left) with Nicole Vitello, President of Oke USA, a Fair Trade company in which the Untours Foundation is a founding investor. Alicia Agnew is the Human Resources director at B Lab, the nonprofit that is behind B Corporations. A Penn State grad with a Masters in Leadership Development, she has extensive prior work experience in recruitment and team building, including with the Philadelphia School District and Girl Scouts of America. Caleb Harvey was fortunate enough to be taken on as an intern with the Untours Foundation by Elizabeth Killough in the summer of 2007. As an intern, Caleb was exposed to the daily operations of Untours’ small business loan program, participated in the Fair Trade Town Committee, and worked on the promotion of Fair Trade products to local businesses. It is from this experience that Caleb got his loyalty to the Fair Trade label and the principles it represents. In the intervening time, Caleb has graduated from Sarah Lawrence College with a degree in fiction writing, and found a job at Pendle Hill, assisting the Director of Hospitality. Caleb continues to be inspired by the Untours Foundation’s innovative model of furthering social justice and sustainability through the empowerment of local businesses and communities, and is excited at the opportunity to play a small role in serving its mission. Linshuang Lu is an organization development consultant and Principal at Praxis. She currently provides organization development, strategic planning, leadership and team development and culture change services to nonprofits and employee-owned companies. She is passionate about helping organizations develop their leaders and foster deeper staff engagement in order to create better workplaces and achieve greater impact. is an organization development consultant and Principal at Praxis. She currently provides organization development, strategic planning, leadership and team development and culture change services to nonprofits and employee-owned companies. She is passionate about helping organizations develop their leaders and foster deeper staff engagement in order to create better workplaces and achieve greater impact. Principal, Praxis Consulting Group. Adjunct Faculty, Philadelphia College of Osteopathic Medicine. BS, Wharton. BA, UPenn, MS Organization Development, American University. Olivia McConnell is a manager at Per Lei and Elan boutiques, and is passionate about empowering women through fashion. Known especially for having an intuitive gift for reading women’s personal style, she is energized when creating new looks that inspire and empower women. Undoubtedly, at the cornerstone of her personal success in this field is my love of diversity, culture and people. She has worked closely with the Untours Foundation on Fair Trade clothing issues, and is a graduate of Temple University. Rev. Sarah Cooper Searight is Associate Pastor at Swarthmore Presbyterian Church. Sarah joined the clergy of SPC in March 2015. She is part of the Interfaith Council of Southern Delaware County. Her primary responsibilities include coordinating and giving guidance to the missional ministries of the congregation, developing new partnerships in relationship to our community both local and global, providing spiritual support and accompaniment to members needing care, and coordinating planning for worship and development of new worship opportunities. Sarah serves as pastoral advisor to both the Board of Deacons and our Stephen Ministers. Sarah is also the clergy liaison to the many committees under the wide umbrella of the Outreach Committee, and to the Worship & Music Committee. Sarah grew up in Dallas, Texas, completed her undergraduate work at Austin College in Psychology, and earned her Master of Divinity degree at Columbia Theological Seminary. After seminary, she served as Outreach Director and Summer Camp Director for Old First Reformed United Church of Christ in center city Philadelphia. Sarah served her first call as Associate Pastor for Christian Formation and Discipleship at First Presbyterian Church in Shreveport, Louisiana. Sarah and her husband Bill Searight (also a Minister of Word and Sacrament in the PCUSA) are the grateful parents of two girls, Maggie (6) and Ella (3).